These plugs are cheap, easy to make, and work well for measuring the moisture content of soil. The Cheap Vegetable Gardener came up with this method in order to add automatic watering to an automated grow system. 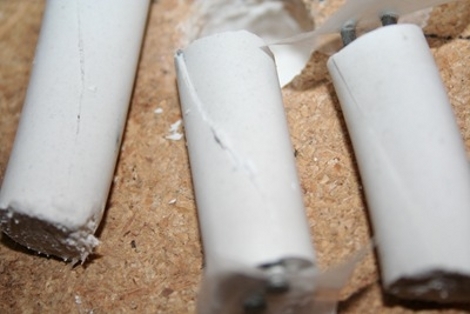 Plastic tubing is used as a mold for Plaster of Paris. Once the plaster has been poured, two galvanized nails are inserted. These are won’t rust and work as probes, measuring the resistance of the dried plaster (gypsum). When inserted into the soil, the moisture content within the gypsum will fluctuate along with the soil. As moisture rises, the resistance between the probes falls, which can be monitored by a microcontroller and used to trigger or stop a watering system.